Join the discussion on our forums! Come discuss Shifting Shade over in our dedicated Shifting Shade discussion topic. Is this guy getting the elemental tag in Un'Goro? He looks like the same type of thing as Shadow and Am'gam Rager and I'm pretty sure they're getting it. Why does Shifting Shade never run out of breakfast? Because his Eggos are eternal. Deathrattle: Copy a Legendary card from your opponent's deck and add it to your hand. Only if your opponent controls it. If you control it, it says "Deathrattle: Copy a Tunnel Trogg from your opponent's deck and add it to your hand." This card turned out way better than I gave it credit for. Great companion card for N'Zoth, always exciting to see what tool from the enemy's arsenal I'm going to get. 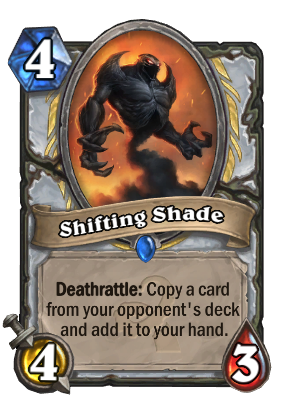 Because Priests weren't annoying enough. This card has become one of my favorite cards of #OldGods. Tied with Forbidden Shaping and Yogg-Saron, Hope's End. Big buff to Museum Curator, 2 cards for 1. Anyone else hear this card say "My Eggoes are eternal?" Might be just me but it seems like this shade really likes his waffles. ahahaha you made my day with this comment! thx, mate! This card performs quite well in my Reno Thief Priest deck. Not as good as Undercity Huckster but it's still solid. This card is very good in a slow meta. However, against hunters and shaman who have lots of 3/2, it trades very badly and doesn't leave something on board, unlike Piloted shredder. This card performs slightly better than expected. It has a Piloted Shredder body, and grabs a random card from your opponent's deck; it allows presence on board, being able to "kill something" for you (say 50% of the time), while giving you "back" a card. Value trade-off. Stats of Piloted Shredder with half a Thoughtsteal as text. Balanced IMO.